The Saints committed six turnovers last week in losing to Cleveland, but the Bucs couldn't register an interception against Aaron Brooks despite heavy pressure led by defensive end Simeon Rice. The Bucs lead the league with 25 picks and their 15- game streak of registering at least one interception ended while the Saints completed a season sweep. Tampa Bay was sloppy right from the start. Rookie defensive end Charles Grant stripped Johnson of the ball on the game's opening drive, but the Saints couldn't capitalize. The next turnover came after New Orleans went ahead 13-9 early in the third quarter. 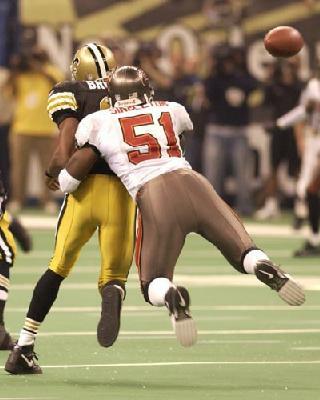 Aaron Stecker fumbled the ensuing kickoff at the Tampa Bay 30, but that mistake was negated when outside linebacker Al Singleton stripped Aaron Brooks and Greg Spires pounced on a loose ball for the only New Orleans turnover. The third Tampa Bay mistake was the most costly as Jay Bellamy grabbed an errant Johnson pass early in the fourth quarter. Johnson had thrown 10 touchdown passes without a pick during a 15- quarter span before he threw the ball up for grabs on a pass intended for Keyshawn Johnson at midfield. Bellamy's 14-yard return set up a 48-yard field goal by John Carney that extended the lead to 23-12, forcing the Bucs to need two scores in the final 10 minutes. The Bucs are 7-0 this season with a positive turnover ratio and 1-3 with a negative differential. As they did in winning the season opener 26-20 in overtime, New Orleans also hurt the Bucs on third down, converting 9 of 17 while Tampa Bay was successful on only 2 of 14 attempts.